When you want to facilitate change (with clients, or your boss, friends or family) listening is the most important skill-set. Humans have the secret answers (and even their own scripts) sneaking out of their subconscious mind via their words and actions. Do you listen well enough to hear the perfect strategy for success? When you know how to HEAR IT you will know exactly how to help create the necessary change. In this workshop, you will learn what to listen for. You will discover how to notice limiting beliefs, motivation strategies, metaphors, and the suggestions necessary to facilitate change. All Emotions/Feelings are good! When they are based in reality. It’s the ultimate mind-body communication system. The difficulty comes from misunderstanding the language. In this class, you will learn to decode the secret messages to get the most out of your life. Imagine being able to “program” yourself for success! Imagine freeing yourself from stress, negative imprints, and painful emotions from the past! Imagine living in the moment and never overreacting again by getting too angry, frustrated or sad! 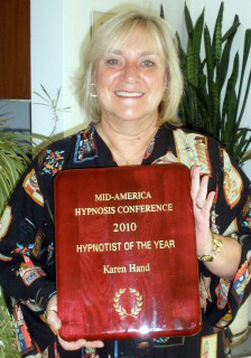 Now is the perfect time to discover how the theory and science behind the Art of Hypnosis is used to facilitate change. Use the skills to guide yourself, your friends, family or clients into the life they want!